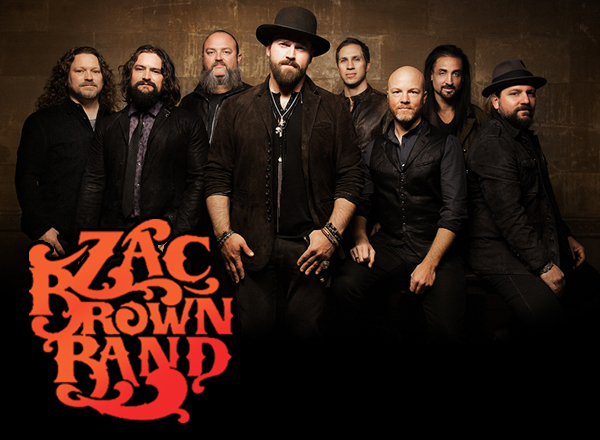 If you see country music fans grinning from ear to ear these days, it's because Zac Brown Band is on tour! Country music’s best-loved entertainer will spread music, fun, and good vibes as he performs on various stage venues all over the country. Zac Brown Band will get the party started as soon as he hits the stage and dish out those wildly infectious hits like "Chicken Fried," "Toes," and "Knee Deep”. Fans are seizing every opportunity to seal the deal with booking their tickets early. A splendid time is guaranteed for all! Don't wait another for tickets are flying off the shelves really fast! Zac Brown started out as some kind of a one-man-band in 2002, who performed on a heavy gig schedule of about 200 bookings a year. His performances evolved into a full blown band in 2004, which now consists of the following band members: The lineup consists of Zachry Alexander "Zac" Brown (lead vocals, guitar), Jimmy De Martini (fiddle, vocals),John Driskell Hopkins (bass guitar, guitar, baritone guitar, banjo, ukulele, upright bass,vocals), Coy Bowles (guitar, keyboards), Chris Fryar (drums), Clay Cook (guitar, keyboards, mandolin, steel guitar, vocals), Matt Mangano (bass guitar), and Daniel de los Reyes (percussion). Zac Brown Band has 10 number one chart-topping hits to their name, out of 16 singles that have entered radio charts. They have bagged awards and nominations in almost every major music award giving bodies like The Grammys, American Music Awards, Country Music Association Awards *(CMAA), CMT, and Academy of Country Music (ACM). The Zac Brown Band is associated with a chock-full of country music tracks that never fail to elicit fun, laughter, good times, great memories, and good vibes.